And again we go by bus to the centre and buy a day ticket. It is the cheapest and easiest way to travel through Barcelona. First we walk up to Montjuic and the nearby Olympic Stadium. One likes it or not. Teije has been to the Olympic village at Montreal and he found that much more impressive. We even don't take a picture... but we are not really sport fanatics. We like the old centre of Barcelona much better. 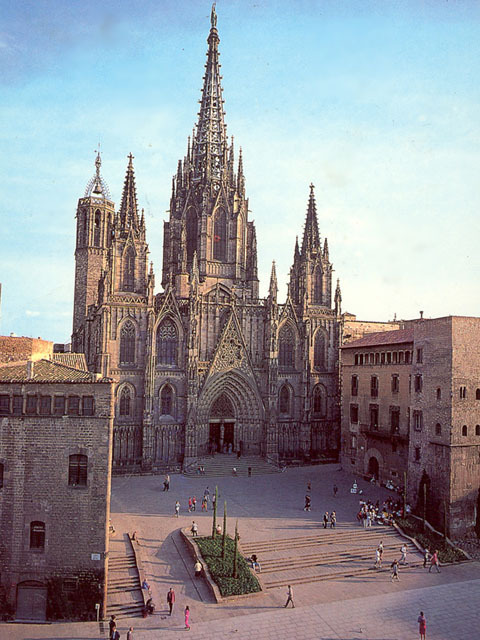 Here the cathedral of Barcelona; not Gaudi's creation, but the original one, situated in the medieval quarters of the city with narrow alleys with lots of peculiar shops and houses. And of course we have to walk over the Ramblas. The tradition of the living statues appears to originate in Barcelona and there are many on the Ramblas. Obviously, the art is copied and living statues can now be found in any major European city. But we have never seen so many of them at one place before and are quite impressed by some of them. Sometimes you only notice after some time that a statue isn't a statue but a living being. Apart from them, the Ramblas offers a vivid variety of entertainment, market stalls and outdoor cafés. We spend a few hours just looking at everything that goes on. We return quite late to the camping, tired, but satisfied and decide to make up a list of everything we want to see the next time we will come here again. Two days is too short a period to see all there is to see. Yesterday we already have decided to return one day to Barcelona, but we don't know then it will be within a few months! You can read more about it on the Barcelona-pages. Well, at least we have seen a bit of this city, on our way to Portugal! We have to cross the whole Iberian peninsula on our way to Portugal and we decide it won't matter which way we take. So we first go to Cordoba, a Moorish city we both want to see. With Sevilla, it is one of the most interesting cities of Andalucia (south Spain). During the Muslim rule (711 - 1263 AD.) Cordoba has been the cultural and artistic centre of the "Al-Andalus"-empire, and also the capital of the western Caliphate. Muslims, Catholics and Jews all put their own stamp on this medieval city. We don't know if we can cover the distance from Barcelona to Cordoba in one day (almost 1000 km) and we don't want to rush. 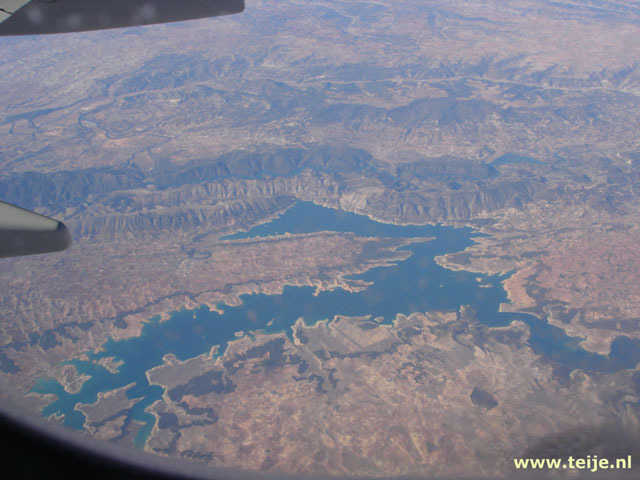 But after 500 hundred kilometers and with temperatures well above 35°C we are getting bored a bit by the, although beautiful, but also very monotonous tableland of Central Spain and we decide not to loose any time and drive all the way to Cordoba. But when we arrive at the city it takes us more than an hour to find a cheap hotel which still has rooms available. By chance we find a hotel in the old city with a room for only one night. We want to stay three nights but are glad we have at least found some place to stay. The owner speaks about 2 words English (yes, no) and we speak three words Spanish (si, no, manana). Later we understand (using sign language) that we can have the room for 2 nights; it is very small and we have to return to the reception to ask how the key works. There is no bar and we are too tired to look for one outside, so we take a softdrink at the reception. How tired can one get after a day sitting in a car... We still have to walk back to the car to get our things, and we notice we are exhausted. We have no energy left for a stroll through the city and go to bed immediately. We have been driving for more than 14 hours.